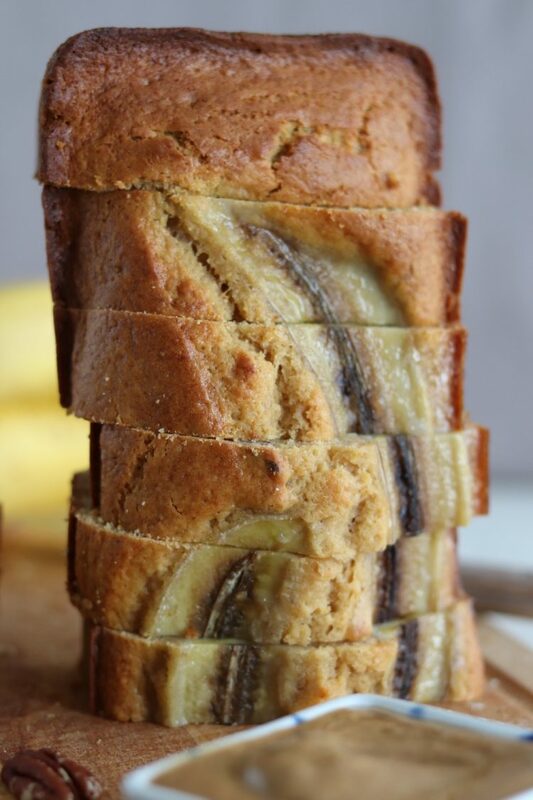 Since I first saw a picture of a beautifully stapled banana bread, I have been looking for a recipe to try. 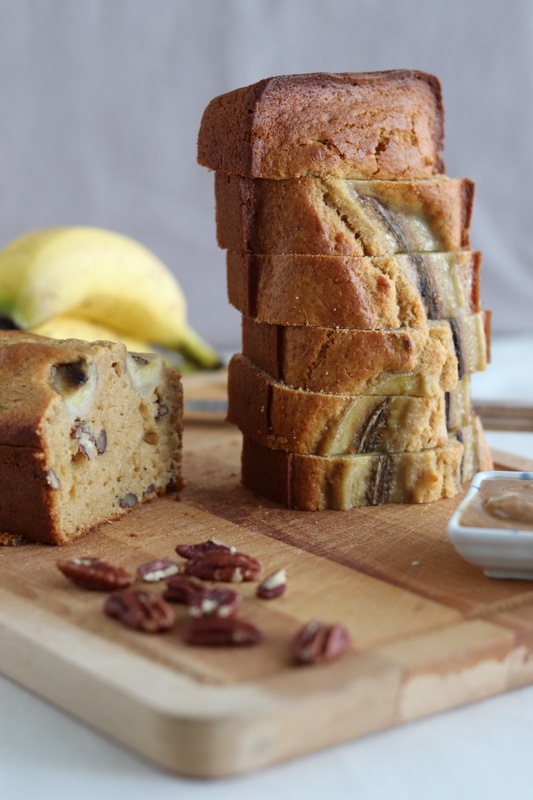 The thing is, I don’t like my banana bread to be too banana! I mean, I want nuts and other flavours in it as well, I don’t want the banana to be the only thing it tastes like. 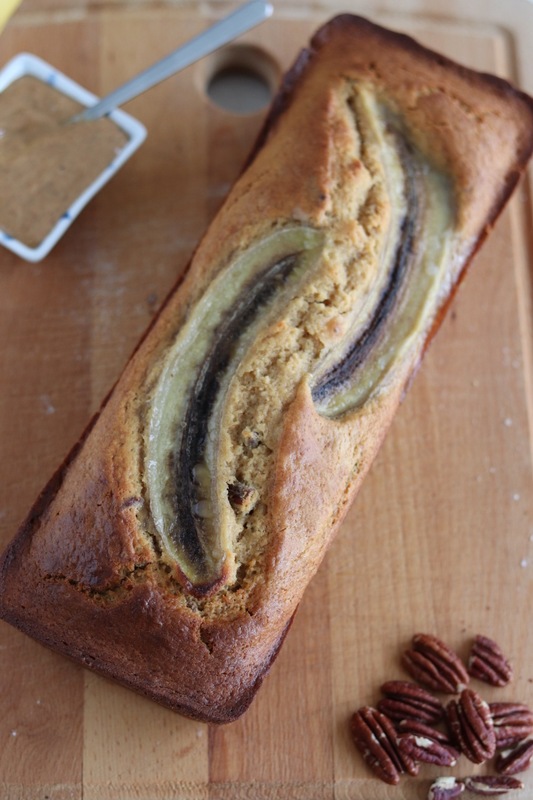 Yes, I know, that’s me (eyes rolling), I want a banana bread that doesn’t taste too much like bananas!!! So, what do you think? Did I promise you too much?? Ok, I have a couple of other nice pictures to show you, so let me get started with the recipe, so that I can have some text on this post and not only pictures.. It’s a food blog after all! 2. Spray a plumcake baking tin with non-stick spray or simply brush with oil or melted butter. 3. Whisk together the sugars (80g white + 45g palm or brown), eggs (2), milk (60ml), vanilla (one splash) and oil (75g) until well combined. 4. Add the mashed bananas (130g) in and mix well. 5. Now add the dry ingredients: flour (220g), baking powder (3/4tsp), a pinch of cinnamon, a pinch of salt and mix just until combined. 6. Add the chopped or simply crashed pecan nuts (30g) and mix them in with a spatula. 7. Pour the dough in your baking tin. 8. Cut the leftover banana in half and place it on the surface, it is going to caramelize and look stunning! 9. Bake for approximately 40 minutes or until golden brown and dry inside (toothpick test!). 10. Let the tin cool down 10 minutes before removing the bread. 11. Let it cool down completely on a rack before slicing it. 12. Enjoy with almond butter. Spray a plumcake baking tin with non-stick spray or simply brush with oil or melted butter. Whisk together the sugars (80g white + 45g palm or brown), eggs (2), milk (60ml), vanilla (one splash) and oil (75g) until well combined. Add the mashed bananas (130g) in and mix well. Now add the dry ingredients: flour (220g), baking powder (3/4tsp), a pinch of cinnamon, a pinch of salt and mix just until combined. Add the chopped or simply crashed pecan nuts (30g) and mix them in with a spatula. Pour the dough in your baking tin. Cut the leftover banana in half and place it on the surface, it is going to caramelize and look stunning! Bake for approximately 40 minutes or until golden brown and dry inside (toothpick test!). Let the tin cool down 10 minutes before removing the bread. Let it cool down completely on a rack before slicing it.